Big Green SwitchBlogSolarWhat will further accelerate the adoption of solar? Solar power has grown rapidly for over a decade. In 2010, the U.S. installed a combined 825 megawatts of residential, commercial, and utility-scale solar panels. The year after that, total installations doubled, and two years after that, they doubled again. The total installed solar capacity nearly doubled again between 2015 and 2016, when over 14,000 megawatts of solar was installed and solar power became the number one source of new energy capacity in the country. Solar has grown so fast in the U.S. that the Bureau of Labor Statistics has found that solar installer is projected to be the fastest-growing job in the country through 2026. Worldwide, the situation is much the same. Led by China and the U.S., solar installations in 2016 grew by 50 percent compared to the year before, and solar power accounted for two-thirds of all new energy sources added to the world’s grids. Despite these dramatic steps toward a cleaner, more sustainable world, solar has a long way to go. In the U.S., solar still accounts for only about one percent of all utility-scale energy consumption. Globally, solar penetration is just as low. But understanding how solar power achieved such rapid and widespread adoption over the past few decades will illuminate how the industry and renewable energy advocates can continue to accelerate the adoption of solar energy in the future. Economic forces are the primary reason behind the increased adoption of solar power. As solar has become more affordable, both utility-scale and rooftop installations have increased. There are a variety of reasons why the cost of solar has dropped so precipitously over the past few decades. Some of these reasons are due to industry advances, and others are due to public policies. On the industry side, improvements in solar cell technology, manufacturing techniques, and supply chain streamlining have conspired to steadily reduce the cost of solar panels. In 1977, solar cells cost over $76 per watt. The following year, they dropped to about $67 per watt, and the year after that, they dropped to just $40 per watt. 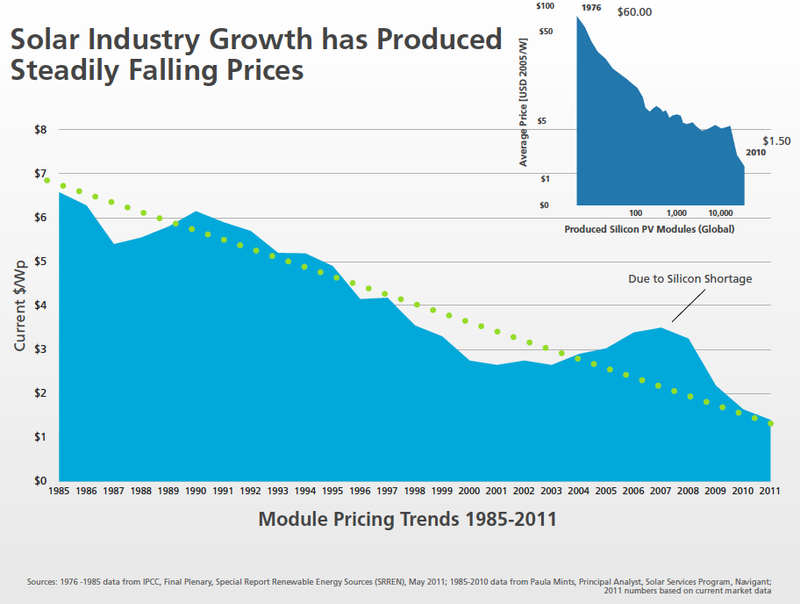 By 2013, the price of solar cells was more than 100 times lower than it was in 1977. The declining cost of solar cells and panels began to make them more competitive against traditional forms of energy generation. In 1985, for instance, solar energy cost about $6.50 per watt. By 1995, solar energy cost just $5 per watt, and by 2000, the price had dropped below $3 per watt. Today, the cost of solar in many places － including 20 U.S. states and over 30 countries － is at or below the cost of energy from fossil fuels (a phenomenon known as grid parity). In most places, solar just barely edges out traditional forms of energy production, but in some cases, the cost of solar is far below the cost of energy from traditional sources. In Chile, for instance, solar electricity costs 58 percent less than the cost of energy from a new natural gas plant. But costs haven’t fallen simply due to better manufacturing techniques. Other advances have occurred on the installation side. Today, a typical installation takes four hours, but 10 years ago, that same installation took about 16 hours. By reducing installation times, installers can service more customers and save money on labor costs. Along with costs associated with installation labor, other “soft costs” (including marketing, customer acquisition, regulatory compliance, and other non-equipment costs) will need to come down if solar is to continue becoming more affordable. Apart from advances in solar technology, manufacturing, and industry practices, a suite of public policies have made solar a strong competitor in the energy market. The expansion of free trade agreements is one such set of policies. Installers in the developed world － including the U.S. － have long been able to offer affordable panel installations in part because they purchase panels from China and other Asian nations that produce solar panels cheaply. Free trade has also allowed many panel makers to locate their facilities abroad in order to reduce manufacturing costs. Kyocera Solar, for instance, is headquartered in Japan but manufactures its panels in Mexico and the U.S. And SunPower is based in the U.S. but has manufacturing facilities in China, the Philippines, and Mexico. Critics argue that free trade exploits indigenous workers abroad, harms the environment, and devastates the domestic manufacturing sector in the U.S. (though this isn’t true for the solar manufacturing sector, which grew 26 percent in 2016). But limiting free trade will dramatically slow the growth of solar energy. After the Trump administration’s decision last month to impose tariffs of up to 30 percent on imported solar cells and panels, the Solar Energy Industries Association, which represents over 1,000 companies, found that the tariffs will lead to U.S. job losses of 23,000 in 2018 alone. Bill Vietas, president of RBI Solar in Cincinnati, said the tariffs “will increase the cost of solar and depress demand, which will reduce the orders we’re getting and cost manufacturing workers their jobs.” And an analysis from GTM Research found that the tariffs will lead to an 11 percent decline in installations through 2022. Governments also play an important role by providing financial incentives that promote the adoption of solar energy. In the U.S., for instance, the federal government has offered a renewable energy investment tax credit (ITC) since 2006. Homeowners who install solar energy systems can claim a credit on their taxes equal to 30 percent of the system’s cost. Purchasing a $20,000 solar system, for instance, would allow the homeowner to essentially discount that price by $6,000. 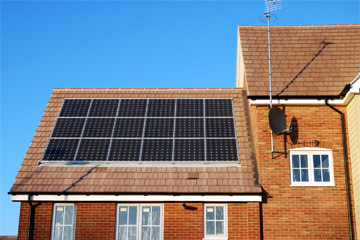 According to the SEIA, “The ITC has proven to be one of the most important federal policy mechanisms to incentivize the deployment of both rooftop and utility-scale solar energy in the United States.” The organization also notes that the ITC “provides market certainty for companies to develop long-term investments that drive competition and technological innovation” which, in turn, lead to lower costs and higher installation rates. When those incentives decline or go away completely, so too do solar installations. In the U.K., for instance, the number of solar installations in 2016 fell by nearly 50 percent after the government reduced financial incentives for homeowners by 65 percent and slashed subsidies for utility-scale solar investment. A related effort, the Department of Energy’s SunShot Initiative, supports R&D programs and encourages homeowners to go solar through education and outreach. Last year, the initiative met its goal of making utility-scale solar competitive with traditional forms of energy production three years ahead of schedule. SunShot continues to work toward lowering the cost of commercial and residential-scale solar installations. As long as the cost of solar continues to decline below the cost of energy from fossil fuels, solar installations will continue to grow. Individuals can facilitate this growth by voting for politicians who support solar tax credits, investments in solar research, and related policies. And a coalition of industry and environmental groups can further accelerate the adoption of solar by exerting additional pressure on policy makers to make solar even more accessible and affordable.